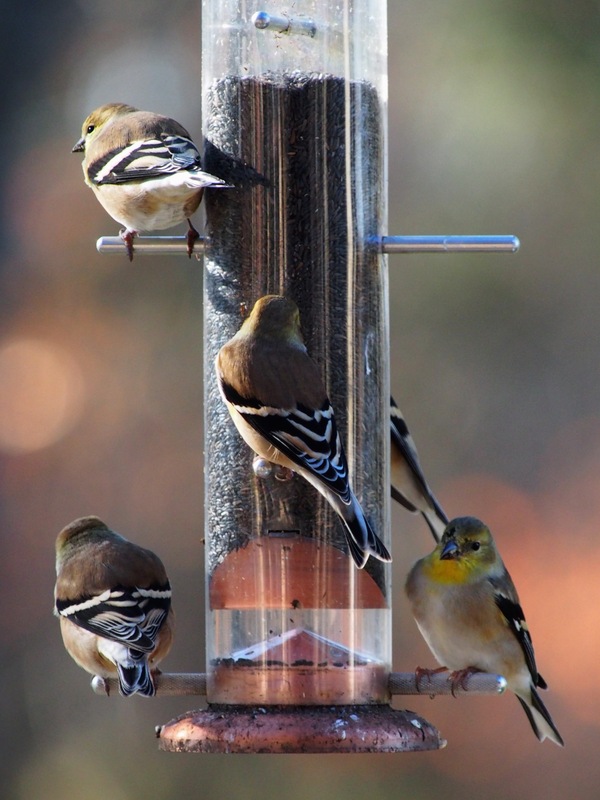 A question – how many goldfinches can you fit on a feeder? I bet a few more would fit if only the feeder were fuller. 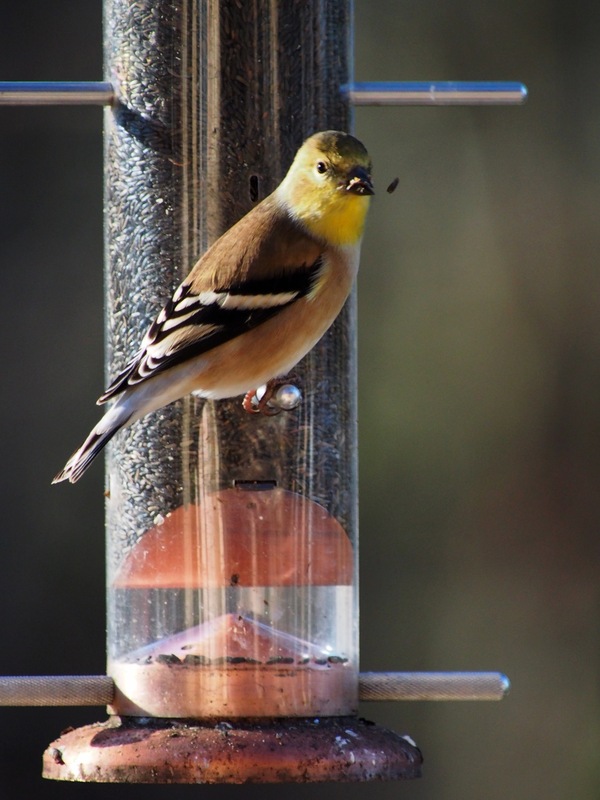 This entry was posted in birds, Ozarks, Photography, wildlife and tagged birds, goldfinches, Olympus, Olympus E-M5, Ozarks, photography, the eff stop by artsifrtsy. Bookmark the permalink. No reason to ever feel guilty – stop by when you feel like it! 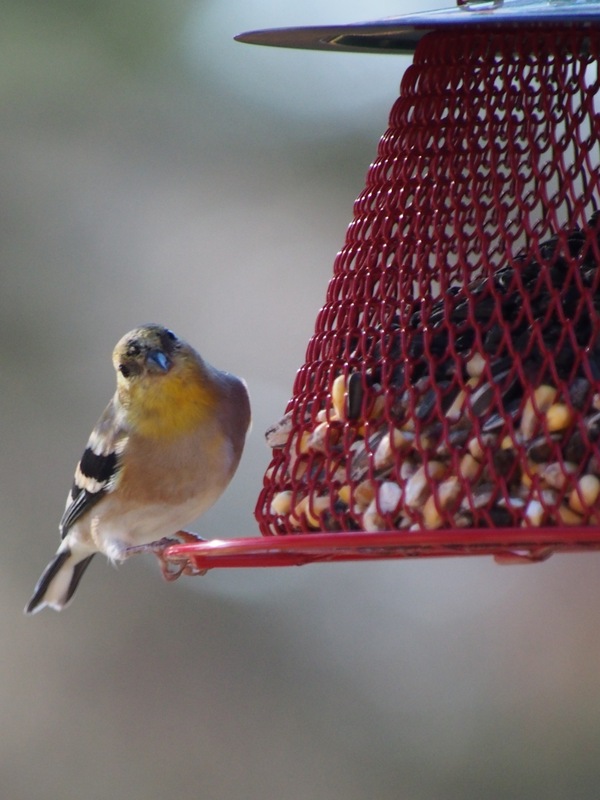 Thanks – I have a huge line of feeders about 10 feet from my back door. The birds are so used to me that I can sit out on the porch and take their photos most days. The finches are very thick this time of year. these are so lovely and FUN! I haven’t seen much in the way of birds near my windows or balcony for ages, but I do hear them chirping away as my desk is next to the window. Once again, I wished l lived in the country or away from the city. I did buy a feeder and put some old budgerigar seed on it a few months ago, but didn’t tempt any passing birds. Maybe I need to buy some fresh multi-purpose seed from the pet store. A couple of years ago I caught a bird biting off strands of Thyme from the potted herb seedling on my balcony and flying away with it (to line it’s nest presumably). What a great series! Thanks — perfect for a Sunday afternoon. LOL – Burl Ives – I can relate today. My cardinals are still so shy. The finch feeder didn’t get much action in the summer but now I’m slammed. I fill that sucker up every 48 hours. 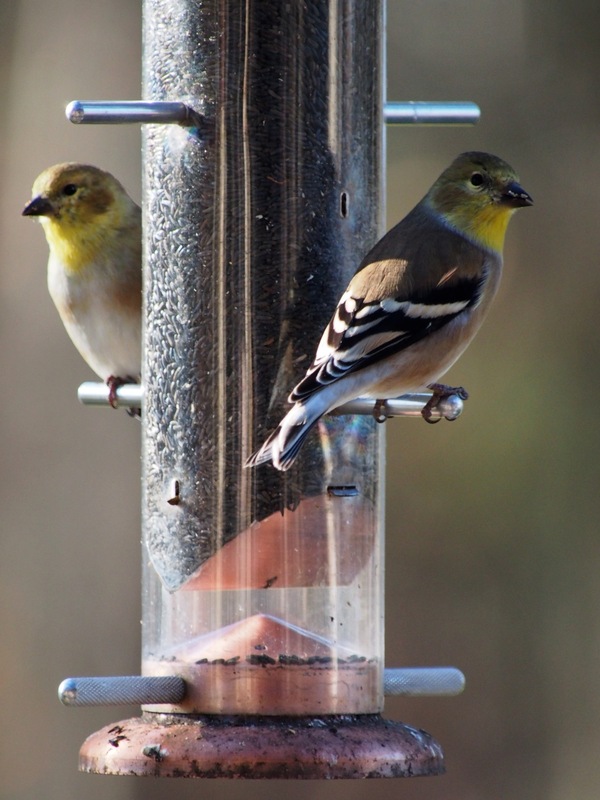 I think this is the right season for finches. Putting it out last spring did nothing. I saw a finch just the other day. 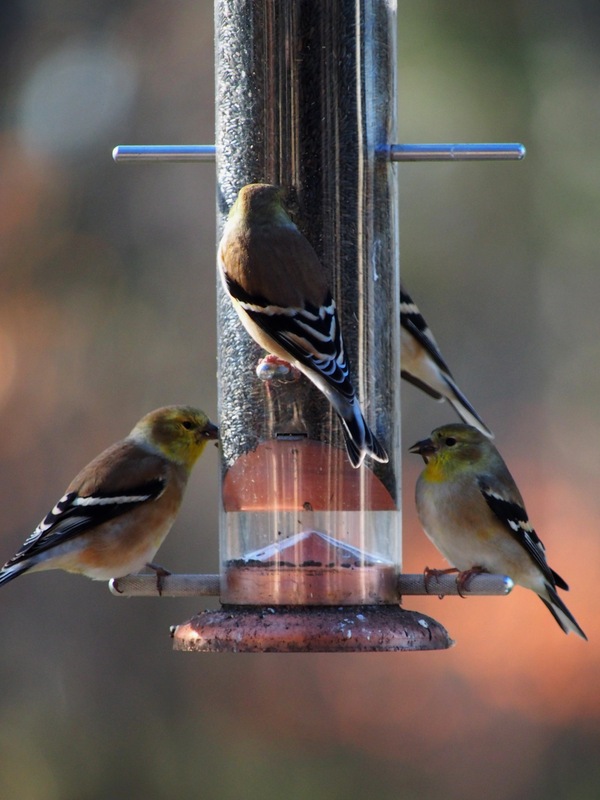 If only we’d taken advantage of the Black Friday savings at the bird seed store and picked up something for that finch feeder! We too seem to have quite a lot of hog birds. Yep, about every 48 hours they’re scraping the bottom, looking for crumbs. 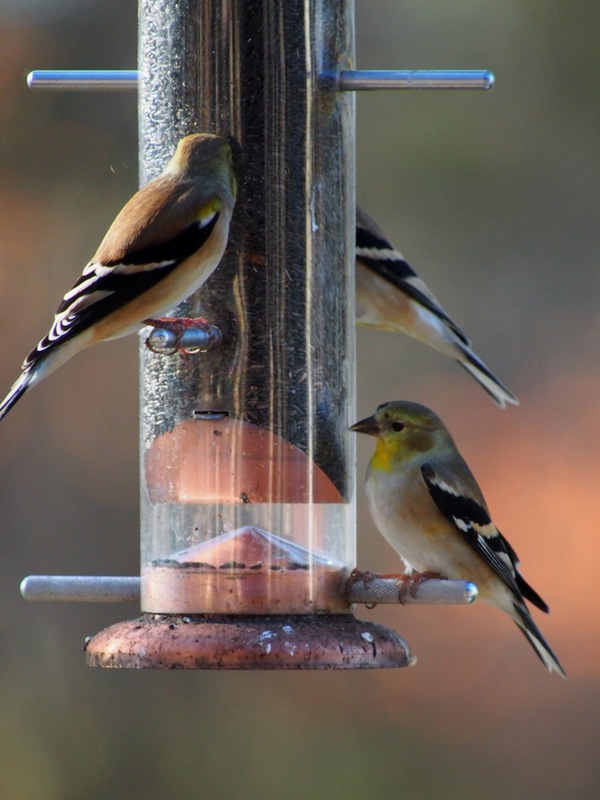 I just spent about a half hour on the porch and I an stunned at how many finches are out there – dozens – all waiting to drop in on the feeder. This is my first year feeding, A cardinal was watching waiting for me to leave. They must be stocking up for winter.